Panama Nautical Club is ready to entertain the entire family on your adventure and help you make the most of Panama with kids. Spark a love of nature and the sea in even the smallest child. While some months may not be seaworthy for less experienced fishermen, we have a variety of activities for everyone that can be enjoyed at the island lodge or its surroundings. Included in your vacation package is paddle boards, sea kayaks, and snorkeling equipment to ensure everyone gets in the water. Feel free to take this equipment to explore the Bolanos Island. In the water, you will find a rainbow of life under the sea; green turtles, puffer fish, sponges, coral, mollusk, as well as vibrant schools of fish are all waiting to be discovered. See the full list of marine tours and activities here. 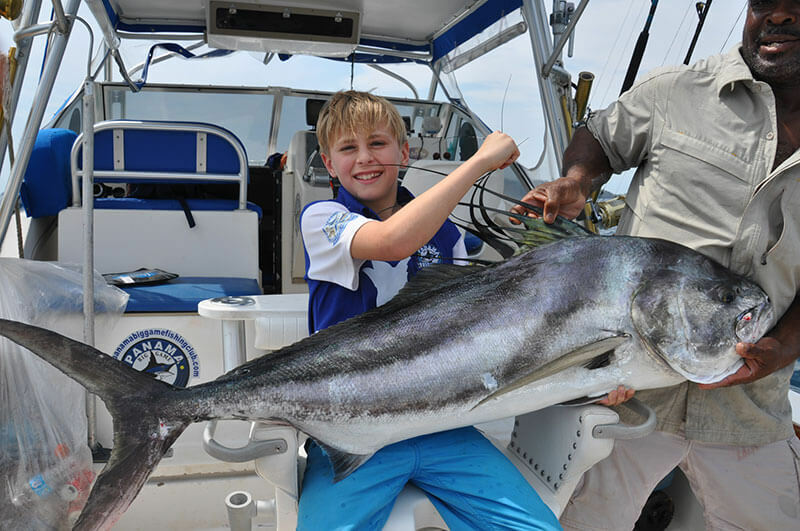 Of course Panama Nautical Club highly recommends bringing the kids to a family fishing trip as Panama is one of the world best locations for top sport fishing experiences. There is literally no better place to get the kids started with fishing and making sure they fall in love with your favorite hobby! For a more land-based adventure, the Gulf of Chiriqui offers two distinct national parks for you to explore. Coiba National Park is located on the largest island in Central America. Formed between 12,000 and 18,000 years ago, the animals on the island developed in distinctly different ways from mainland animals: here you can find the Coiba Island howler monkey, Coiba agouti, and the Coiba spinetail. Linked to the Galapagos Islands this spot is home to hundreds of animals still unclassified in modern science. It’s the last home to many endangered species, such as the crested eagle, possum, and the howler monkey. Take your kids on an impossible to forget hike in this new ancient world. Our second national park, the Gulf of Chiriqui National Marine Park, comes to life August through November; when humpback whales use the grounds to teach their babies the rules of the sea, diving and swimming. An unforgettable view for every child. The whole family can also enjoy a ride with the captain aboard one of our panga boats to enjoy a scenic search for humpback whales and dolphins in and around these great national parks. No matter which activity you and your family chose to partake in, your time among this ageless nature will be a memory you share forever.